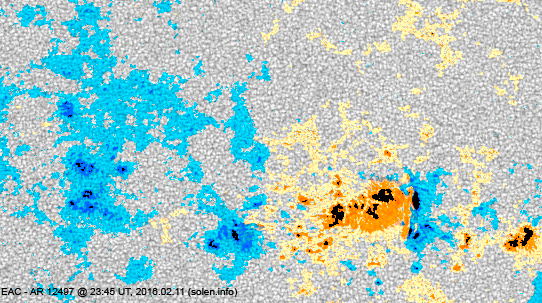 Last major update issued on February 12, 2016 at 04:40 UT. 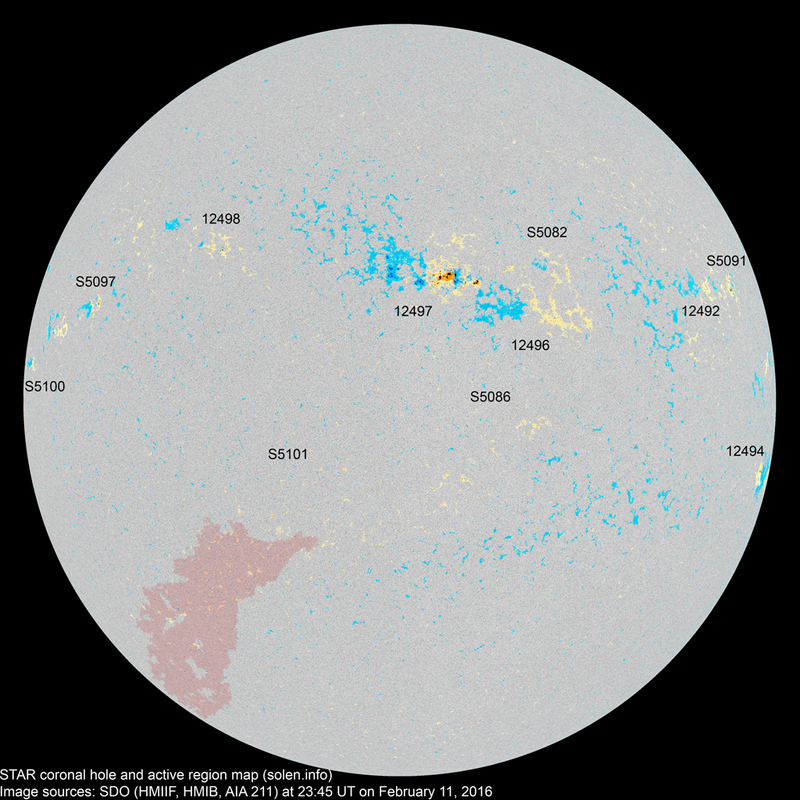 The geomagnetic field was quiet to unsettled on February 11. 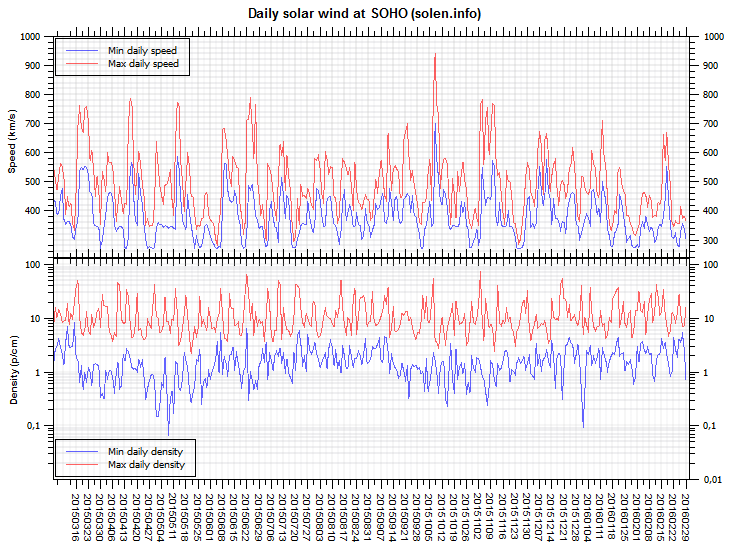 Solar wind speed at SOHO ranged between 294 and 384 km/s. A disturbance was observed beginning at ACE after 16h UT and may be associated with a co-rotating interaction region related to CH714. 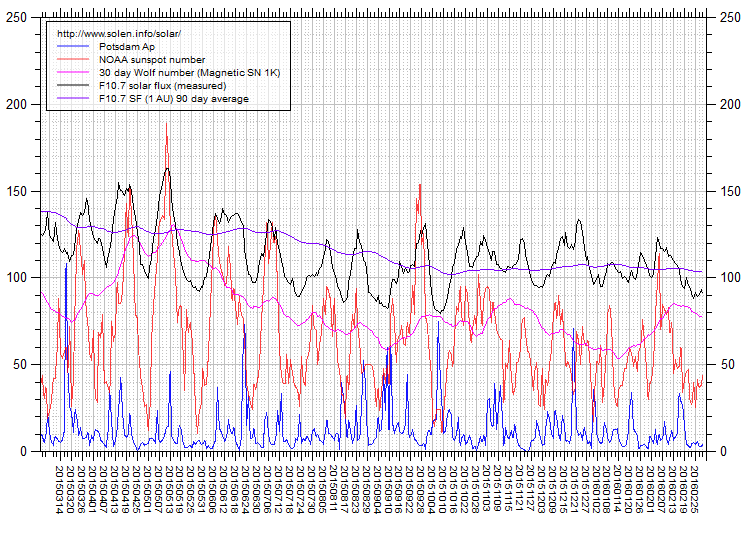 Solar flux at 20h UTC on 2.8 GHz was 112.6 (increasing 9.1 over the last solar rotation). 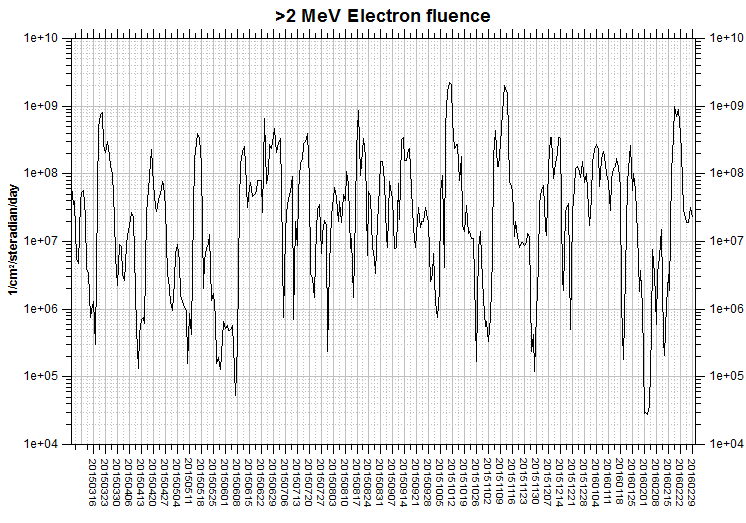 The 90 day 10.7 flux at 1 AU was 105.4. The Potsdam WDC planetary A index was 7 (STAR Ap - based on the mean of three hour interval ap indices: 7.1). 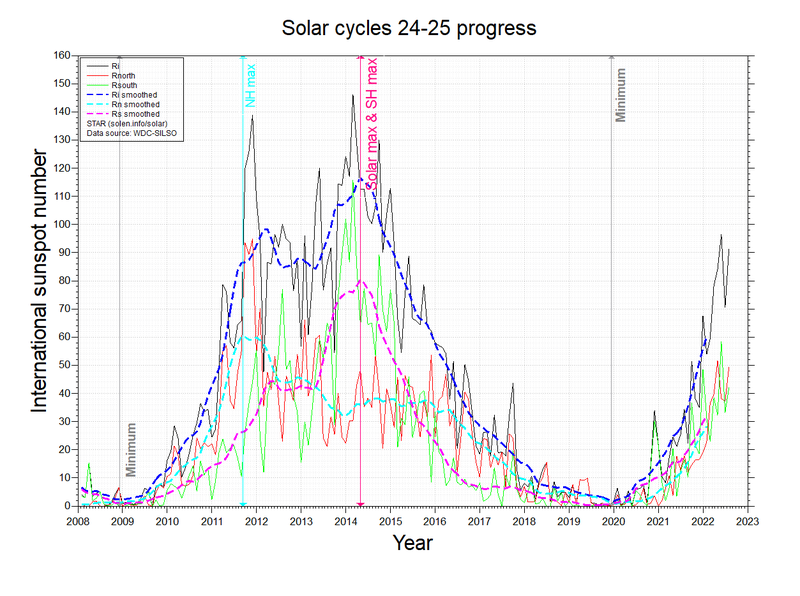 Three hour interval K indices: 21212213 (planetary), 22333223 (Boulder). At the time of counting spots (see image time), spots were observed in 11 active regions using 2K resolution (SN: 206) and 10 active regions using 1K resolution (SN: 147) SDO images on the visible solar disk. Region 12492 [N13W57] was quiet and stable. Region 12494 [S12W81] decayed slowly losing mature penumbra on all spots. Region 12496 [N08W20] decayed slowly and quietly. Region 12497 [N12W06] decayed early in the day. 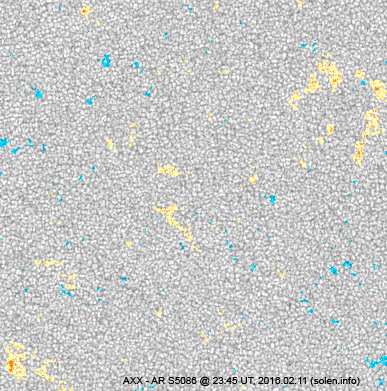 A new region emerged (AR S5099) emerged just west of this region. 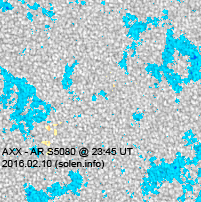 After noon the trailing part of AR S5099 merged with the leading part of AR 12497 which caused a magnetic delta to form. As a result of this the region became more active and could produce a minor M class event. Region 12498 [N18E31] was quiet and stable. S5082 [N14W27] was quiet and stable. 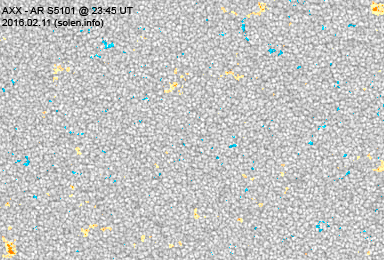 S5086 [S15W13] reemerged with tiny spots. S5091 [N14W66] decayed slowly and quietly. SWPC has moved AR 12492 to this region. S5097 [N11E55] was quiet and stable. New region S5100 [N05E78] rotated into view. New region S5101 [S24E17] emerged with tiny spots. February 9-10: No obviously Earth directed CMEs were observed in available LASCO imagery. 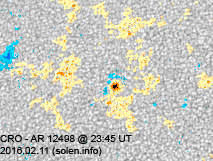 February 11: A halo CME was observed after the C8 LDE in AR 12497. 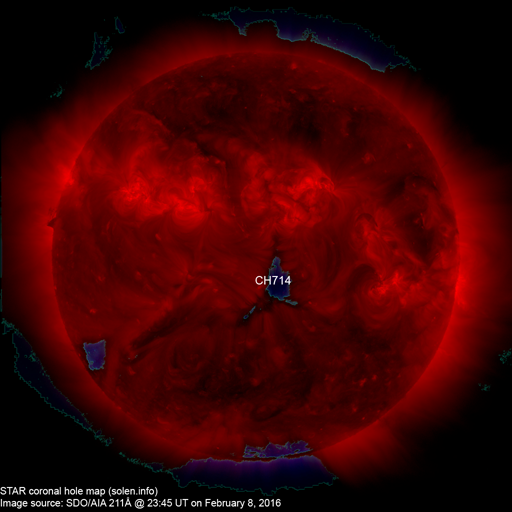 The CME could reach Earth on February 14. The geomagnetic field is expected to be quiet to active on February 12 due to effects from CH714 and quiet to unsettled on February 13. Quiet to major storm conditions are possible on February 14-15 due to effects from the February 11 CME.